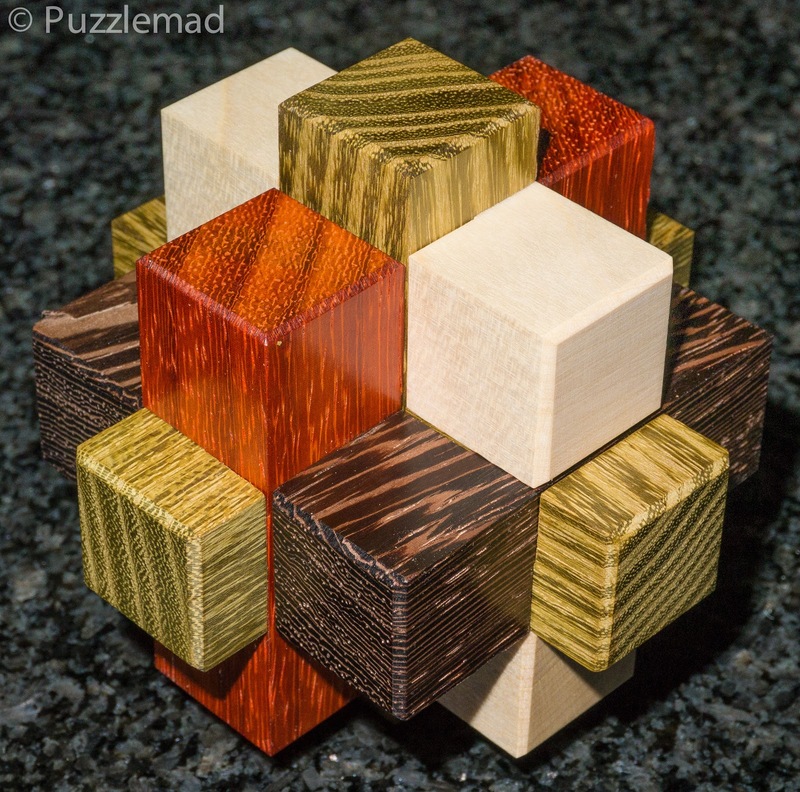 PuzzleMad: Interlocked and even packed successfully! What's the collective noun for a group of Pelikans? Recently I received another rather large delivery from my friend Jakub. Every few months he whispers sweet somethings in my ear and my brain falls out along with the contents of my bank account! My last purchase consisted of 7 gorgeous puzzles which I have shown above. I initially thought they were all either interlocking puzzles or burrs - little did I know it but one of them was a packing puzzle! I try never to buy packing puzzles because I can't do them but Jakub bewitched me and I just bought them all! I haven't told Mrs S about the cost of my collection and it's on a need to know basis......She doesn't! Luckily Jakub's work doesn't break the bank. Over the last few years you know that I have a trouble with getting wood! Stop that!!!! I just can't get enough - now, stop that thought again!!! 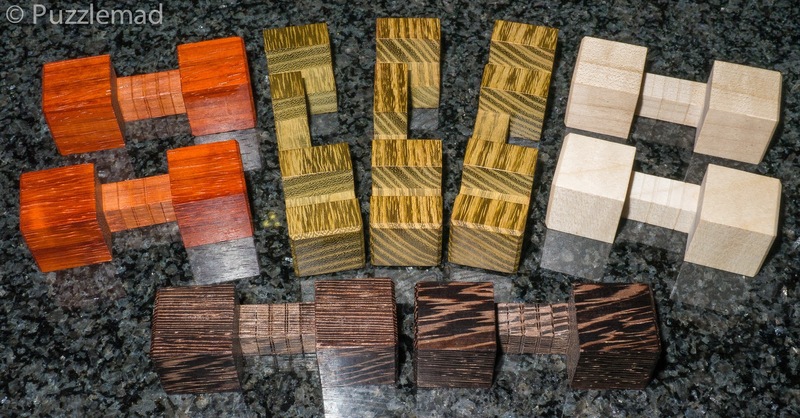 I am a sucker for most puzzles but particularly when they are made by a good craftsman in fabulous exotic woods. 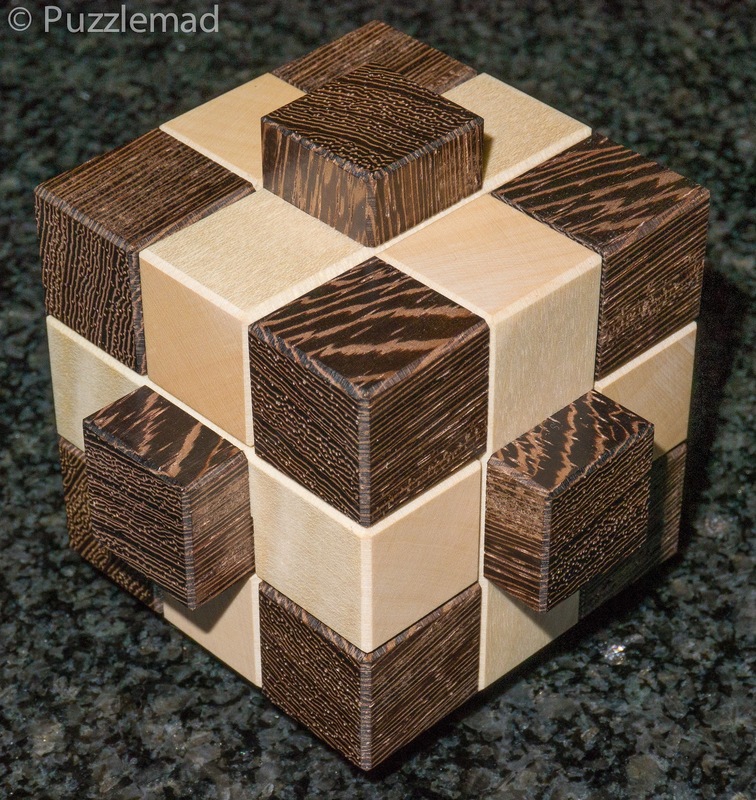 I have been buying from Jakub for a couple of years now and can only say that the quality of his workmanship just gets better and better - at the last Midlands Puzzle Party both Allard and myself came to the conclusion that Jakub was now up to Cubic standards. Luckily for me (and the rest of the community) they seem to focus on different puzzles. 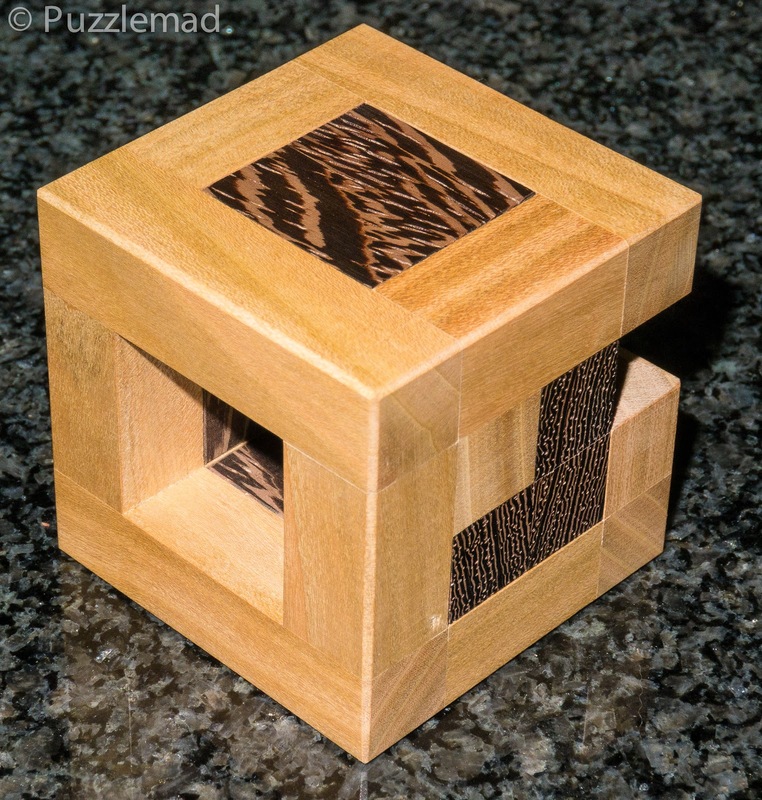 Jakub has also been very successful in getting his work stocked bu puzzle sellers from all over the world. I started my little odyssey into these with one that Allard reviewed a little while ago. Petit puzzle was designed by Osanori Yamamoto with a nice beginners level 11.2. Jakub knows how I love the contrast between light and dark woods and so mine arrived made from Oak and Wenge - lovely! It is a simple 2 piece burr in a cage and it was this one in particular that made us marvel at the improving skills of the Pelikan boys. The aim is to just "take it apart and put it together again". There's a good few blind ends on the way and a very interesting move but the disassembly only took me a few minutes and I was left with this. 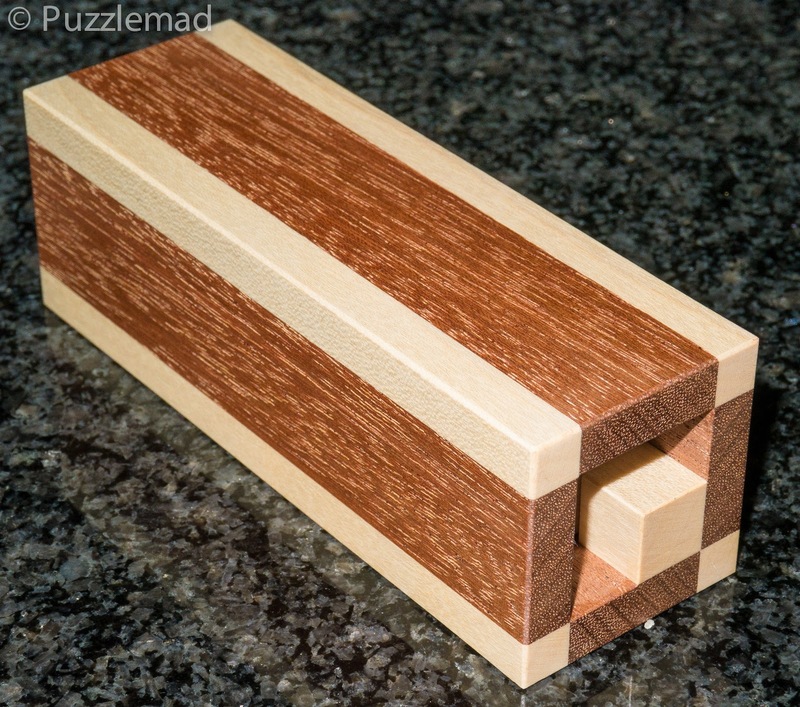 Petit puzzle - just 3 pieces - easy! I was feeling cocky so having taken it apart I immediately just jumbled up the pieces and left them for a 15 minutes or so - how hard can it be? Well luckily not too hard but I had inconveniently forgotten the orientation of the frame and the burrs so it did take me a pleasant 1/4 hour to reassemble! It is actually one that I enjoy repeating again and again - it has become a sort of burr version of a worry bead for me. 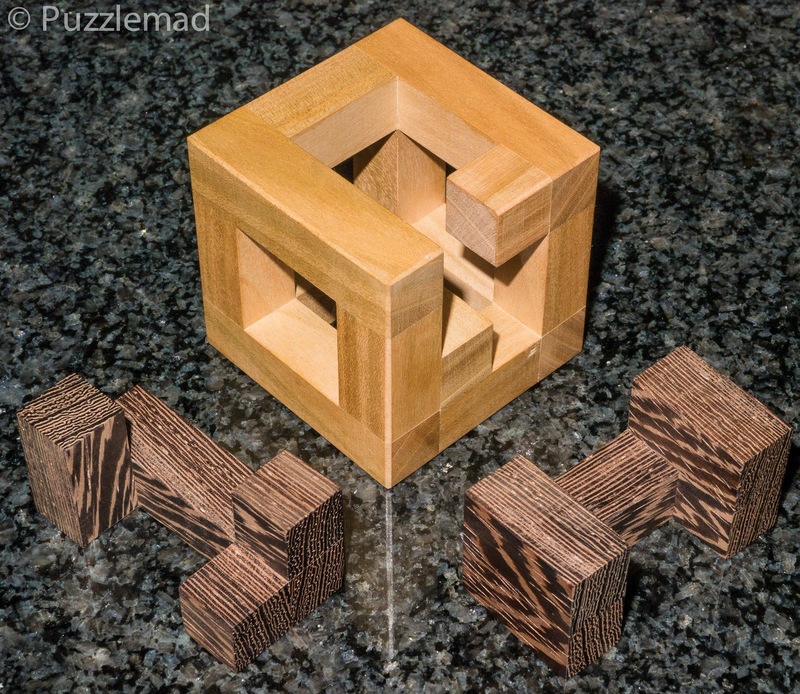 The next two I tried were Rastaban and Cubax both designed by the very talented (and my good friend) Turkish puzzle designer, Yavuz Demirhan - I thought that these would be a trivially easy; I though that they were just interlocked in an easy fashion. They are both related and both have a similar approach but are different enough that I am pleased that I got the pair. Starting with Rastaban (beautifully made from Maple, Padauk, Wenge and Robinia), my thoughts were confirmed as I dismantled it in just 2 or 3 minutes and again scrambled the pieces. 6 identical burr pieces plus something else! Now this time I had been rather too cocky! Yes there are just 6 identical (and very simple) burr pieces, but the inner 3 piece burr was a bit more complex and I had paid absolutely no heed of how they were arranged and had not really looked at how the outer pieces interplayed with the inner ones. After about 30 minutes it was time to put it back together again and......I couldn't do it! I sat in front of the TV with the first wife and effed and blinded repeatedly until she had sharp words with me! Fearing the 'burn' again, I proceeded quietly and actually had a thought about how it could work. 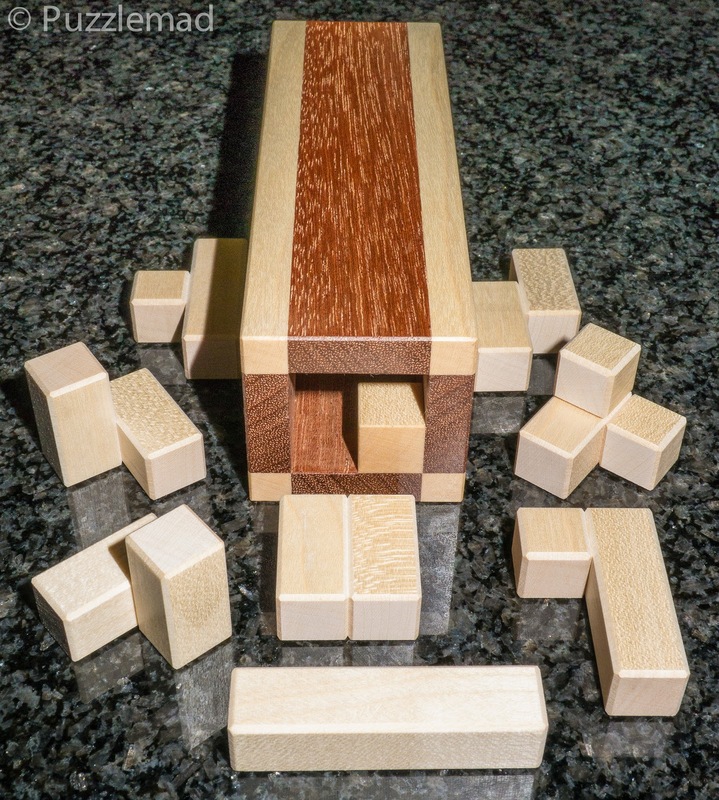 My problem was that when I placed the small pieces, I was unable to move the core to allow access to the other slots for more to go in. These had to be placed in exactly the right order - sneaky Mr Demirhan! Sneaky! Finally after about 2 hours on and off, I had it back together with a huge sigh of relief. I took it to work the following day and showed one of my orthopaedic surgeons who for some strange reason, shied away from me and started to cry in the corner of the operating theatre (I must be easier on the poor fellow in the future! Ho ho ho!) During a big long case my anaesthetic assistant had a play too - he managed to take it apart quickly but completely failed to reassemble it and wandered off after half an hour muttering dark things under his breath! I do seem to have this effect on people. 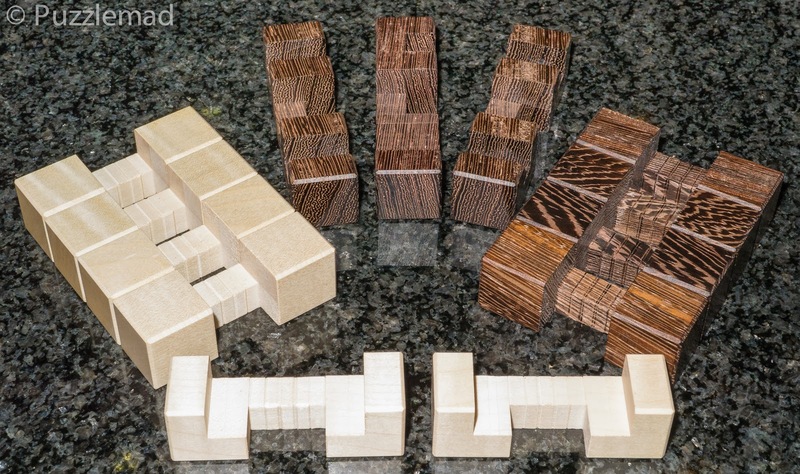 Cubax (made from Wenge and Maple in a lovely checkerboard pattern) came apart in a similar fashion but had more pieces and they blocked each other even more. Now again, the not very bright Dr S just took it apart and scrambled the pieces. My rationale was that it was similar to Cubax and so it would not be a problem! Now the key term here is "not very bright"! Yeah! The basic approach of the core was similar but after that it is a bit different and blocking is even worse. One other thing about me is that I have the memory of a goldfish - in fact there's a strange woman in bed with me every morning and I have no idea who she is! She says we are married but surely I wouldn't have been that stupid? Ouch!!!! Sorry dear! Cubax took me another 90 minutes to reassemble - I haven't dared let anyone else play with it yet! I bought All tetra stick by Osanori Yamamoto without having the slightest clue what it was. I saw a gorgeous tube made of wood and thought it was a box of some kind. I don't collect boxes but it was so unusual and not at all expensive that I just said yes. It is stunning again and made of Maple and Walnut (I think). When I took it out of the package, and lovingly turned it over in my hands there was a sudden shower of bits! This shower of bits consists of 8 tetrominoes - OMG it's a packing puzzle and I can't do packing puzzles!!! But how hard can it be? I first of all made a nice sausage shape with the tetrominoes so they would fit inside and then put them into the tube.....erm failed to put them into the tube! That single cubie at the front of the tube seems to get in the way! In fact it means that the pieces are really difficult to put into the tube! You have to put them in the correct orientation, correct order and then, because there's no rotating them when they're inside, you need to ensure they can just slide into the correct places. I was slightly horrified after I realised this. But luckily after about an hour of more effing and blinding, I finally succeeded! I have, at last, solved a packing puzzle!!! These are brilliant puzzles, not too expensive and beautifully made so go ahead and get them - you will not be disappointed!!! Tetra stick by Osanori Yamamoto? Can’t find them anywhere? It was your birthday last week - I don't do this for everyone but you do a lot for the community with your FB page so pm me on FB or email me and I will send it to you as a gift for your birthday. My pleasure mate! You've earned it. Enjoy it in good health!